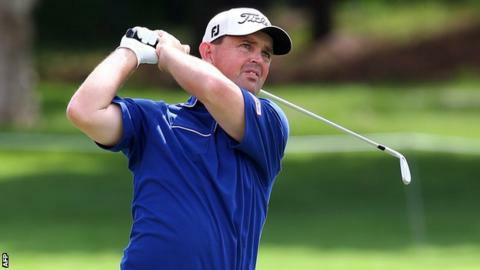 Greg Chalmers captured the Australian PGA Championship for the second time after a remarkable seven-hole play-off. Fellow Australians Adam Scott, Wade Ormsby and Scott Strange had started the final day in a tie for the lead. Strange slumped to a four-over-par 76 but Scott and Ormsby carded 71s to reach 11 under, joined by Chalmers who surged up the leaderboard with a 64. Ormsby was eliminated at the third hole of the play-off, which Chalmers won when defending champion Scott bogeyed. It was the longest play-off in a top-tier Australian tournament. Ormsby missed a putt from around five feet to win at the second extra hole at the Royal Pines Resort on Queensland's Gold Coast, and bowed out on the next hole when his two opponents made birdies. World number three Scott three-putted from less than 30 feet to hand 41-year-old left-hander Chalmers his 10th professional title. "Just phenomenal, I'm worn out," said Chalmers, who had only 26 putts in his sizzling eight-under round of 64, two of which were in excess of 50 feet. Chalmers, who won his first Australian PGA Championship in 2011, made eight birdies in what was the lowest round of the tournament.